The secret to a deeply bronzed grilled chicken with incredibly crisp skin and meat that is imbued with a miso-like savoriness that is irresistably mouthwatering? Shio-koji, a fermented rice product made by inoculating cooked rice with koji spores. The rice is then dried and combined with salt and water, and fermented for about a week. The end result is an ingredient that breaks down proteins and starches while adding a level of umami to foods like nothing else. Put chicken on a plate or sheet pan and brush shio-koji all over the skin. You can also loosen the skin around the neck and thighs and brush/rub shio-koji under the skin. Place the chicken in the fridge, uncovered for at least 24 hours. Start an indirect fire in your grill: build a big pile of coals on one side (For a gas grill, set one side of the grill to 450F and leave the other side off). 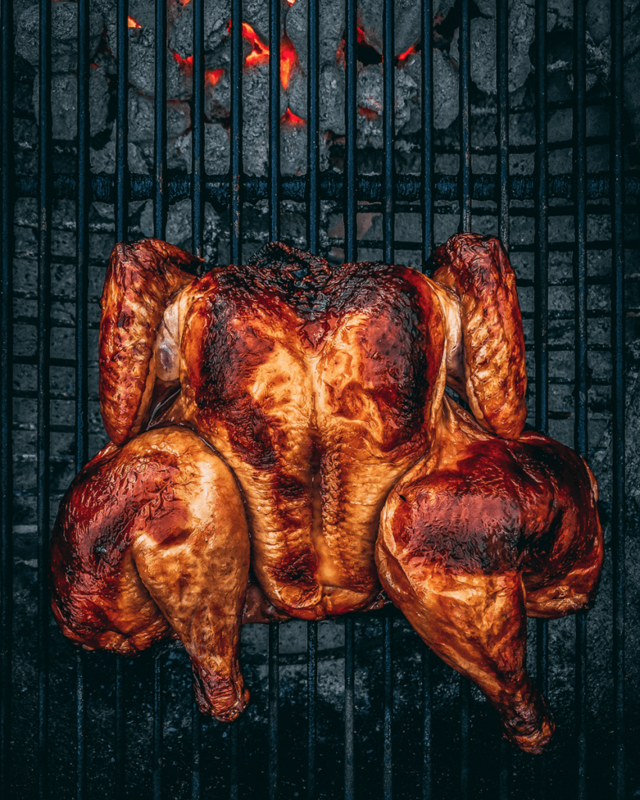 When the flames have burned down and the coals are glowing hot, place the chicken opposite the coals, cover and cook until a thermomter inserted in the the thigh reads 165°F (appx 45-60 minutes). Remove the chicken from the grill and let rest 15 minutes before serving.